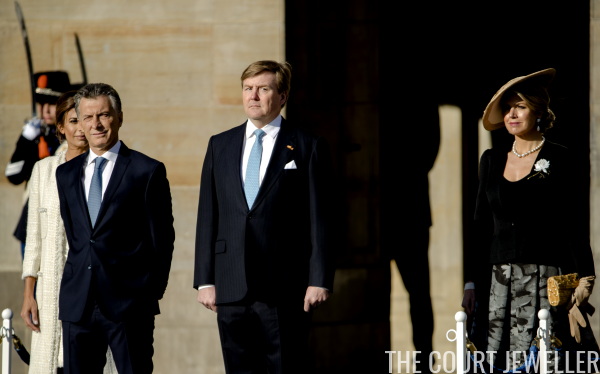 King Willem-Alexander and Queen Maxima welcomed President Mauricio Macri and First Lady Juliana Awada of Argentina to the Netherlands for the start of a state visit on Monday morning. Here's a look at the jewels worn for the welcome events. Queen Maxima chose pearls for the welcome ceremonies in Amsterdam, pairing them with an ensemble by Mattijs van Bergen. (The flower on the jacket, as you can see in this view, is part of van Bergen's design.) She wore her large pearl button earrings with pearl drops, plus a natural pearl necklace. Maxima also wore the eight-stranded seed pearl bracelet, which has a diamond and ruby clasp. 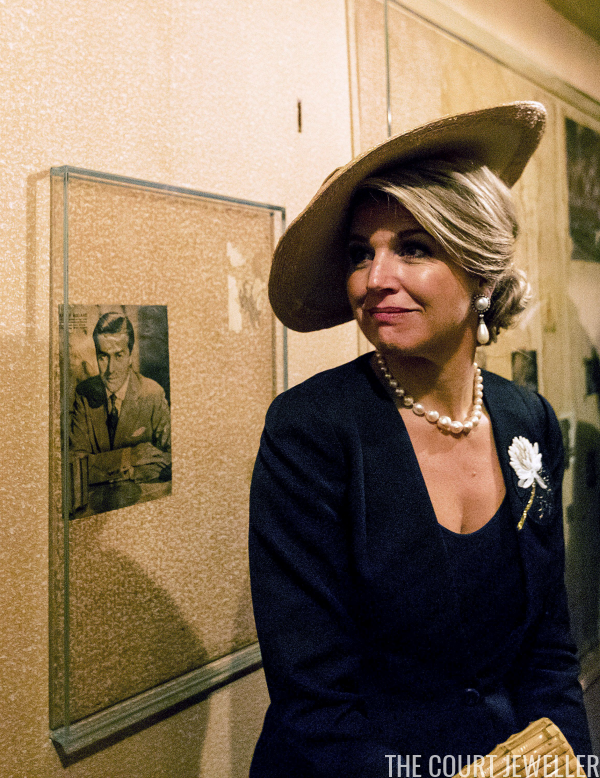 After the official ceremonies, Maxima escorted the Argentine couple for a tour of the Anne Frank House. Here's a look at both of the ladies' ensembles for the welcome events. Maxima, of course, has extensive ties to Argentina. She was born and raised in Buenos Aires, and she and Willem-Alexander now own a home in Argentina, where they often spend holidays. She has met the Macris several times, and they hosted her on an official visit to Argentina last autumn.